I wanted to color using my color pencils. The critter is from Mama Elephant Up & Away – I was surprised myself when I realized that I just always picked the bunny from that stamp and the other two critters were left untouched! Sad – so I set about to make that untrue! 😀 Anyway, the clouds are from Paper Smooches Spreading Sunshine and the sentiment, a combination of Winnie & Walter The Big, The Bold & Party and The Big, The Bold & The Happy. Everything is stamped using Memento Tuxedo Black and colored using Faber Castell Polychromos color pencils. Once done, I trimmed one side and die cut the other using Paper Smooches Borders 2. The pattern paper is from DCWV Christmas & Winter stack. 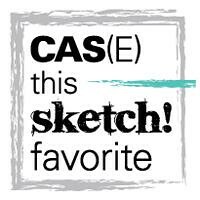 PE: CAS(E) This Sketch Favorite!! Pretty simple and straight forward card. I used Paper Trey Ink Live Love Laugh with Memento Tuxedo Black, Hero arts Bubble Gum, Paper Trey Ink Sweet Bluch and Melon Berry inks. I then added a few hearts die cut using Lawn Fawn Hearts die, from paper colored with silver glitter from Deco Art Glamour Dust Ultra Fine Glitter Paint. The sentiment, from the same stamp set, is stamped in Memento Tuxedo Black. I then mounted this on the card base, covered with pattern paper from DCWV Christmas and Winter stack. 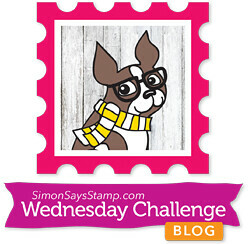 I am not that good when it comes to using those cute critter and animal stamps in my cards – though I love them so much! I always feel something is lacking. But, practice makes one perfect, so here are a couple of cards using some cute owls and bears! For my first card, I tried Mama Elephant Bear Hugs. I first die cut the panels using Simon Says Stamp Stitched Rectangles. I then stamped the bears, the honey pot, the bees and the moon using Hero Arts Black ink and colored them using Zig Clean Color Real Brush pens. I then prepped the card base, by using Lawn Fawn Stitched Borders, stamped the sentiment using Memento Tuxedo Black and adhered the panels on top. Submitting this to ColourQ Challenge #318. For this card, I first embossed a card panel usingAmerican Crafts Shimelle Woodgrain embossing folder. I then stamped the owls using Hero Arts Black ink and colored them using Derwent Inktense pencils. I then die-cut the branch from some brown texture paper using Memory Box Woodland Branch and the hearts using Mama Elephant Confetti die. I then heat embossed the sentiment in white on some scrap black card stock. I then assembled the pieces together. Hello! Inspired by the color combination of black and gold in one of my own previous card, I tried out a couple of other projects! For this really really simple card, I first embossed the background using Spellbinders M-bossabilities Flower Fun embossing folder. I then die cut the doily from Brustro Iridescent gold metallic paper using Waffle Flower Doily Circle. The sentiments are from Paper Trey Ink Wet Paint die & stamp sets. I then added three clear sequins to embellish (can you see them?? :P). For my second card, I first adhered some washi tape with little gold hearts in it on the card base. Then I die cut circles using We R Memory Keepers Nesting Circles on another card panel. I cut the sentiment using Paper Trey Ink Good Times from black card stock and orange foam sheet and adhered them all together. Also used quite a few sequins and rhinestones as embellishment. Made this card using clouds die-cut using Paper Smooches Clouds die, umbrella from Mama Elephant Up and Away and sentiment from Paper Smooches Sentiment Sampler. I used Memento Tuxedo Black for stamping and Zig Clean Color Real Brush pens for coloring. Made this card using chipboard embellishments I had bought a while back – I almost forgot I had them! I thought of using a couple of bracket-shaped chipboards first, but replaced them with the smaller quotes later. The sentiment from Winnie & Walter Big Bold You is stamped in Memento Tuxedo Black ink. For my second card – I got inspired by this card by Maile Belles. For this card, I used Pamass green pigment ink, ColorBox Creamy Brown chalk ink, Hero Arts Soft Cantaloupe and Soft Pool inks with Winnie & Walter Scenery: Its A Wonderful Pennant. I hand drew the strings using Copic Multi-liner. While I stamped the triangles for the first row, I cut out several of the triangles and adhered them directly on the card panel for the second row and foam mounted them for the third row. The sentiment from Bo Bunny Captured stamped in Memento Tuxedo Black ink. For my third card – Simple masking and stamping! I masked off a vertical section on the card base and colored it using Worn Lipstick and Scattered Straw distress inks. I then added some water splatters and then stamped the sentiment and flowers from Kaisercraft XO stamp set using Memento Rhubarb Stalk, Bamboo Leaves and Tuxedo Black inks.